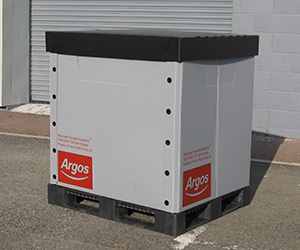 An innovative reusable pallet pack which can provide significant reductions in overall transit packaging costs. 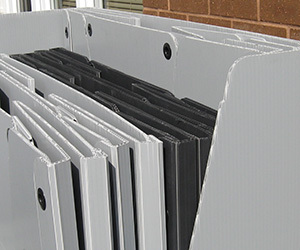 Rapitainer is manufactured in lightweight yet superbly robust polypropylene twin flute plastic sheet. 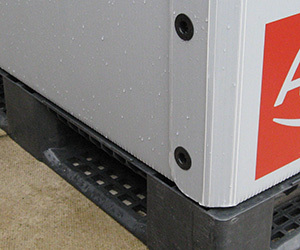 The product is therefore weatherproof and offers high levels of product protection. 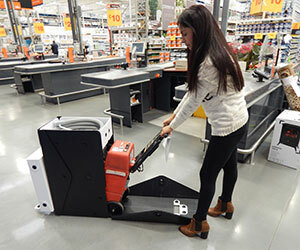 Rapitainer can be universally adopted onto ANY timber or plastic pallet. 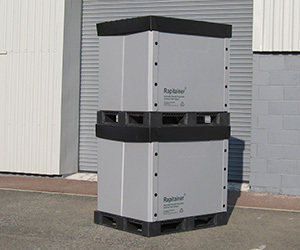 Being extensively reusable, Rapitainer can deliver significant reductions in overall transit packaging and storage costs. 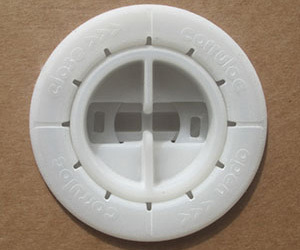 Rapitainer requires no bottom tray (unlike cap,sleeve and tray packs) and this configuration means there is no possibility of water ingress. 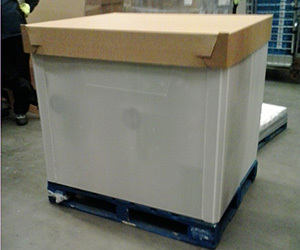 Standard 1200/1000 footprint Rapitainers stacked 2 high. 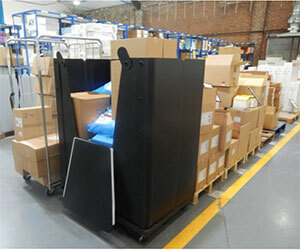 Erected Rapitainers can be used to conveniently return and store flat packed Rapitainer units, saving space and cost. Rapitainer drop gates drop fully for improved access and have easy to use latches to keep them closed. 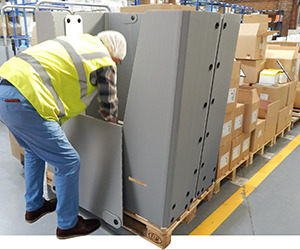 Custom variants can be provided such as this 1300 mm high double drop gate unit for Bullen Healthcare Ltd.
Rapitainer comprises just 2 components - a collapsible sleeve incorporating an innovative dynamic floor and a flat packing top cap. 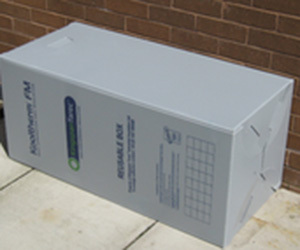 Single trip corrugated caps can be used wherein only the main unit is returned simplifying reverse logistics.